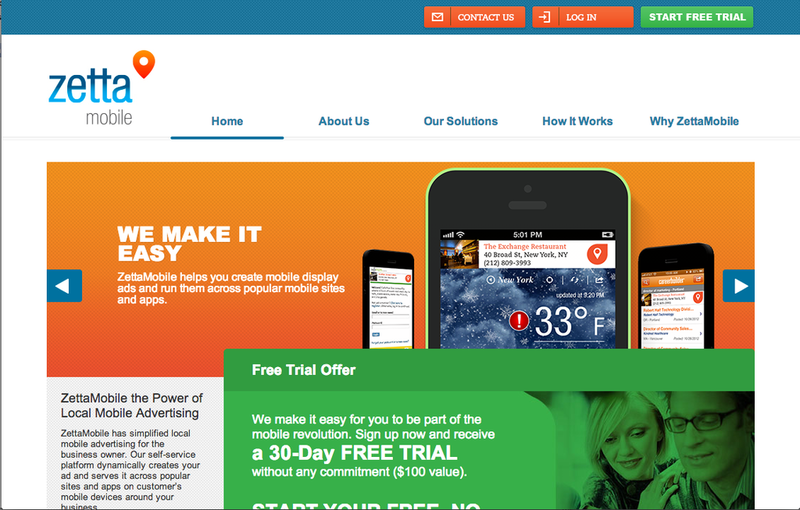 ZettaMobile is a location-based, mobile advertising company building easy-to-use solutions for Small Business. The idea is to empower business owners by leveraging technology, without overwhelming them with complicated tools. Nothing like making it easy. The self-service platform provides an end-to-end solution for SMBs, letting them compete with national companies and other local businesses for reaching people when they’re nearby by dynamically creating mobile ads and serving them across popular mobile sites and apps. As for the name – Zetta represents a large unit of measurement, (1,000,000,000,000,000,000,000, or 10 to the 21st power). 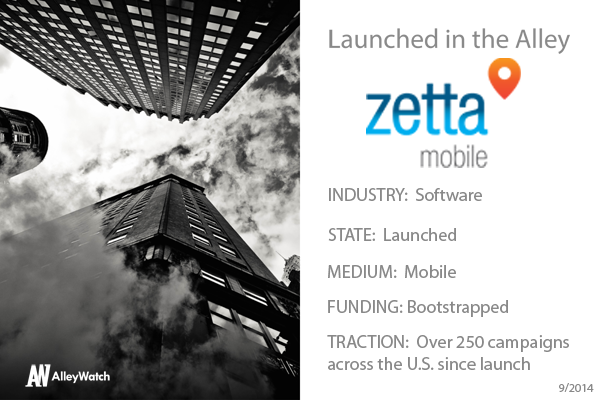 It’s a big number, but then, ZettaMobile’s goal is to make small businesses bigger. Co-founder Kevin Bowers tells us more. Designed for local small business (SMB), ZettaMobile provides a self-service location-based advertising platform for mobile display ads. In industry terminology, we are a self-service mobile demand-side platform (DSP) with a dynamic ad creation product offering. Within a few steps, ZettaMobile users have the ability to add their business, create their ads, set monthly budgets and launch their ads across thousands of mobile apps and websites to prospective customers near their business locations. We geofence the business targeting prospective customers who are in close proximity to the business location. Within minutes, ZettaMobile users can create and launch their ads. Our plans are based on impressions, so business owners easily understand what they are getting. We provide our clients with real-time reporting containing detailed metrics and analytics. Additionally, we provide weekly reporting and email alerts when prospective customers have interacted with the ads (e.g., phone calls, maps/directions, website visits, and send-to-phone requests). We believe this combination differentiates ZettaMobile from anything currently available on the market. We provide access to sophisticated technology and a medium that is not widely accessible by the SMB. We are targeting SMB’s across the U.S. that have an existing online presence and are currently trying to market their business, whether it is a brick-and-mortar or local service. Out of the 23MM SMB in the U.S., approximately 60% have a dedicated website, and 72% use social media to promote their business. (BIA/Kelsey). We are looking towards businesses that can use ZettaMobile as an affordable mobile solution. Our core revenue stream is recurring monthly subscriptions through our business direct, self-service product. We are also developing an API for third-party integration of a white-label solution for resellers, Ad/PR agencies, and publishers. Our ideal investor is one with a proven track record for growing companies working with local small business; and an understanding of the ad technology space. We are seeking early stage investment to scale our business. Why did you expand to New York? We have always been in New York. New York is the perfect environment for our business. It is the advertising capital of the world and it has the largest concentration of small businesses. What was your favorite summer time beach destination close to NYC for 2014? If you saw how pale I was this summer, you would see I haven’t seen one. The closest I came was getting a lobster roll from Luke’s Lobster.